I created this oil to help a client of mine (okay, myself too) with some pretty major legal trouble. It has been used successfully since then dozens of times. It has allegedly persuaded judges, caused opposing witnesses not to show, caused defendants not to show, reduced fines, put harmful people in jail, stopped arrests, won custody cases, gotten children out of unsafe homes, and gotten divorces smoothly and quickly. So how can it do all this? Well, it's created as a "two way" oil. This means it will work both sides of a legal matter for you; positive for you and negative for who your up against. I know what you're saying "I don't have any legal trouble, that's the last oil I need." I've thought that too, and you'd be surprised how quickly things can sneak up. It never hurts to have it on hand for an emergency or for a friend or family member, ESPECIALLY if you have a teenager around;) Contains danda root, calendula, slippery elm, deer's tongue, poppy seeds, black snake root, indian hemp, among other secrets;) feedback- "Bought this for my friend's boyfriend. She put some in his shoes and, burned some on a candle and they threw his case out ;-)" "I was waiting to review this after my court case. I dont know what you do Sarah but EVERYTHING you offer WORKS. I purchased this oil along with the Maman Brigitte paquet to use to turn a small claims suit in my favor (I was being sued) I went to court today after annointing candles with this oil and using it on my hands & shoes and my case was THROWN OUT. Oh my goodness. I am completely speechless. Thank you AGAIN for offering these incredible items." "I must tell you this! You know I love your oils!! 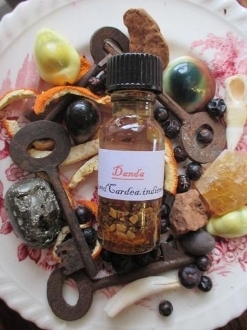 But I used your danda oil in a court case between us and an old landlord that was lying and suing us for " damages" well I used it on a psalm 23 candle rubbed some on my neck and forearms and on the bottom of my heels. Well long story short he left the courthouse before our case was to go to the judge! I mean he disappeared and they dismissed his case! Now I know the oil didn't do that on it's own but coupled with my positive thoughts and " knowing" we were right the oil just nailed it. Thanks again for your quality work!!" thanks for looking! curio only,, not a replacement for legal council or advice.